These two projects in Rimrock, Arizona, were constructed concurrently in a residential neighborhood. Between the two projects, our crews installed 2,704 lf of 6” D.I.P., 1,335 lf of 8” D.I.P, 17 gate valves, 27 water services and asphalt removal and replacement. Located next to US 60 in Superior, this was a waterline job for Arizona Water Company. The crews have been working extraordinary in completing the job ahead of schedule. Upon arriving to the site, the foreman, Marty Garcia, and AWC decided to realign the waterline as the original plans had interferences with power poles and various land owners. Once started, the crew decided to work in sections and backfill as they went. The work consisted of putting approximately 200 LF of 4” DIP through an existing sleeve under US 60 and installing 942 lf of 6” D.I.P. water mainline across Hwy 60 and up Church Ave. This included 6” tapping sleeve, 5-6” gate valves, 5 services, abandonment with slurry fill of the existing piping, and asphalt removal and replacement. TCC provided design and construction services for this CMAR project for the City of Sedona involving rock excavation, installation of a new sewer mainline and services, sewer manholes, storm drain installation and improvements, drainage restoration, and reconstruction of existing roadways. 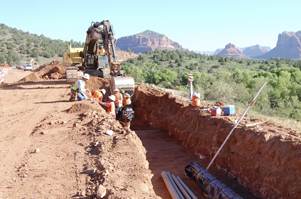 Working closely with the residential community and the City of Sedona, we successfully installed approximately 26,000 LF of new sewer line with 358 services, manholes, and just over 4,000 LF of new storm drains and structures. The project was located in a residential area and easements with narrow access. Once sewer and storm drain installation were complete, the road throughout the subdivision was repaved. 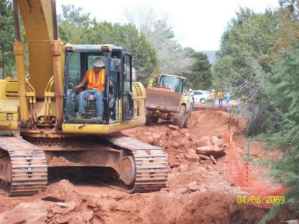 The Kachina Sewer Extension Project for the City of Sedona involved rock excavation and trenching for the placement of new sewer lines and services within a residential community and school zone. The project included manholes, drainage and roadway reconstruction. TCC assisted in the design phase of this project by value engineering a portion of the work, cost estimating and scheduling. We self-performed 96% of the work originally scheduled for one year. TCC completed the project four months ahead of schedule, saving the City of Sedona $210,000. 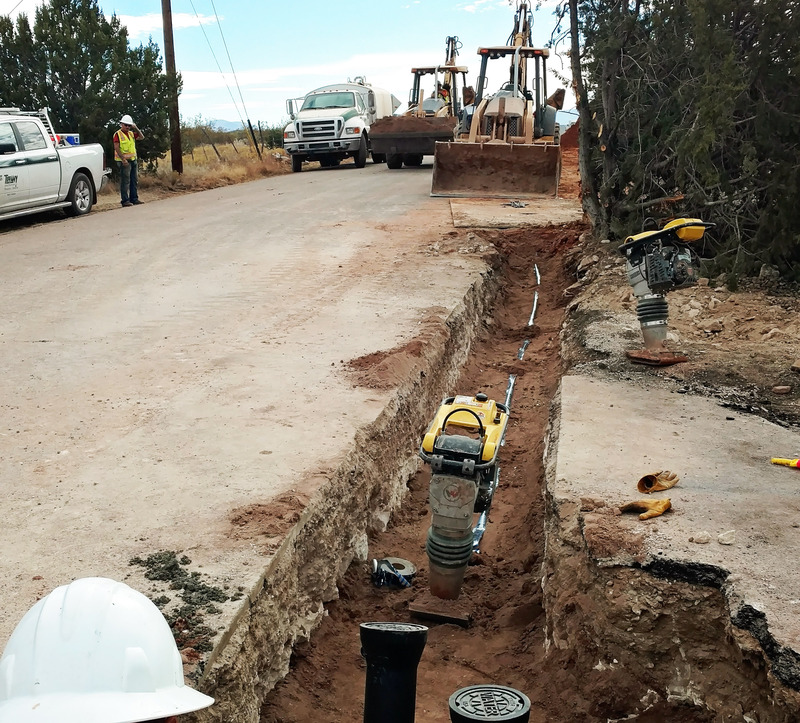 This project included installation of 4424 lf of 12” Ductile water main line and approximately 4400 lf of dry utilities in a joint trench for the US forest Service at their new Red Rock Ranger District location on Hwy 179. We trenched and excavated hard rock for the installation of these utilities in the right of way adjacent to Hwy 179 located south of the Village of Oak Creek. TCC excavated and installed underground utilities for a new 47 lot subdivision at Fulton Ranch in Chandler, AZ. This project Included 3,392 LF of 8” sanitary sewer, 32 manholes, 4,133 lf of 8” DIP waterline, 4,900 LF of dry utilities and 2,106 LF of storm drain ranging from 12” to 24”.